Oktoberfest 2013. The voyage home. And the the journey home starts. Sue was a complete no show all day. Maddening seeing as I was walking around with the stuff I got her from England. If you think that a good beer to drink is called “stella” then stop reading now as this post obviously won’t be for you. Why? Becuase obviously you think it’s the best beer you has tasted without even bothering to look invite shopping isle next to the common beer isle. I would be you are the same type that orders a vinadloo in the curry house of your choosing because it’s hot and proves “something”. 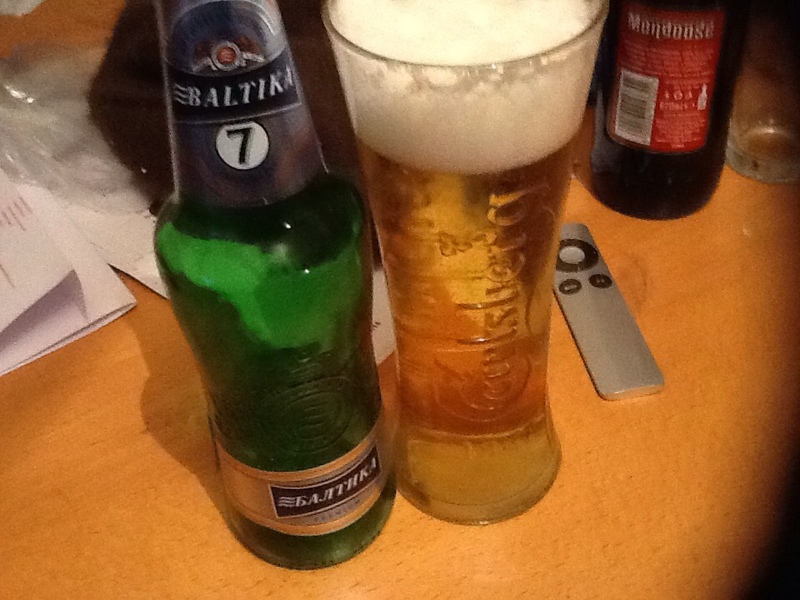 Should your drink be smething more to life than waking up with a post, wife beating hangovear then I can strongly recommend Baltika. Quite why, as the British public, we put up with such a low standard of drink served with each and every day/weekend in our pubs underpaid and exorbitantly high price for them is beyond belief. If you’ve drunk the premium larger such as Stella don’t you deserve it to yourself to go out there and try a different thing to compare it against before parting with your hard earned cash? If not is entirely up to you, however you are missing out on a treat. You’re missing out on the pleasures of all light fresh tasting beer. We aren’t talking” fresh” like Budweiser but a beer that’s actually pleasurable to drink at an early evening stage. And if you are going out for a sociable evening session you pretty much guaranteed to be there at the end of the night in a somewhat fit state unlike if you drank Stella. Before anyone bothers to post a comment to say how can you say this drink is better than stellar, turn this on yourself. How can you say Stella is the best one out there when I bet the majority of people reading this happened even tried a decent German beer.